Water resources development is the process by which the world's water sources are engineered to deliver adequate quantities of high-quality water to serve the forecasted needs of society. In the United States, the public attitude toward the development and use of the nation's waters has changed over time, as have trends in development policy and practice. A historical perspective highlights some of these shifts. From the turn of the twentieth century until about 1965, the U.S. government dominated the undertaking of water resources development works. Local interests gained support for favored projects and then federal funds were used to finance them. This could be deemed the "big dam era" because of the predominance of many large water projects. The period from 1965 to 1975 might be characterized as the "environmental era." The federal government continued to construct water projects, but some of this responsibility began to be transferred to the states. Federal support shifted from water supply to pollution control, and the landmark National Environmental Policy Act of 1969 imposed a legal requirement that environmental impacts be addressed in the planning, design, and construction of federal water projects. Between 1975 and 2000, federal funding for water projects was reduced, and greater responsibility for water resources development was assigned to the states. Moreover, environmental protection became a major goal of society, and the public began to demonstrate that it wanted to participate in decision-making processes regarding water resources. This high-capacity pumping station provides water for agricultural uses in the San Joaquin Valley of southern California. Developing a water supply on a large scale requires not only an adequate source but also a means to extract the water, generally electric-powered pumps (in contrast to human-powered hand pumps for small supplies). Here a utility employee checks the electric meter. The rights to withdraw and use water in the United States are determined by state and federal statutes, administrative regulations, and court decisions. Water rights policies dictate who is entitled to withdraw water, how much water can be withdrawn, and the purposes for which it can be used. The term "beneficial use," which defines the allowable uses, is the use of water for purposes considered worthwhile to society. Historically, the principal withdrawal uses have been public and domestic supply, agricultural (irrigation and livestock), and industrial-commercial. The use of water for environmental purposes traditionally was not included. But today, values such as the conservation of fish and wildlife habitat are widely recognized, and water supplies are being made available to these instream uses. Such allocations for instream flow may be substantial, however, and they may reduce the amount of water available to the traditional withdrawal-based water-using sectors. Resolving this conflict can be contentious, and is made more difficult by the uncertainty of estimates of water needs for environmental purposes. In general, fresh water is needed for most uses, but saline waters can be desalinized if such sources are available and the cost of their conversion is acceptable. Renovated wastewater is commonly used to irrigate lawns and golf courses, and to replenish, or provide, aquifer storage for later withdrawal and use. Identifying prospective users and estimating their "true needs," as opposed to their "wants;"
Estimating the cost of implementing the water development plan. The goal of water supply development should be meeting the target need. This may be achieved by making additional water sources available, reducing the demand for water, or a combination of the two. In the past, water planners commonly estimated growth in their regions over some time horizon (often a single forecast) and then recommended that the calculated demands based on this growth be met by developing new water sources. By providing ever more water, growth prophecies were usually fulfilled. Today, the approach is to explore alternative patterns of growth, and to make detailed estimates of the water needs associated with them. Rather than recommending new source development as the only way to deal with anticipated growth, an analysis is made of the potential for demand reduction, recirculation of commercial and industrial water supplies, modification of industrial processes, upgrading inefficient agricultural irrigation systems, and developing landscapes that require less water to maintain. The attractiveness of renovating and reusing wastewater is illustrated by noting that 50 percent or more of the public water supply is often discharged to streams or the ocean as waste, in many cases having been treated to almost drinking water quality before being sent on its way. U.S. water resources development now depends less upon structural approaches and relies more on demand management options such as those previously mentioned. Water demands are met by a combination of practices, one of which is to develop new water supplies. 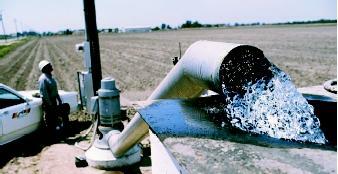 Groundwater sources are tapped by wells and surface waters are pumped directly from rivers, streams, and lakes. But few new dams will be built in the United States as public opposition to that practice has mostly ruled it out. Other techniques for storing waters, such as aquifer storage and recovery, are available, however, and they are becoming more popular. These systems operate on the premise of capturing excess waters and pumping them into underground reservoirs for recovery and use during times of need. Water-supply development approaches used in other nations are similar to those used in the United States. However, in developing nations, water development approaches tend to be more traditional, and dam-building is still viable in many regions. SEE ALSO Conservation, Water ; Dams ; Demand Management ; Desalinization ; Economic Development ; Groundwater Supplies, Exploration for ; Law, Water ; Planning and Management, History of Water Resources ; Rainwater Harvesting ; Reclamation and Reuse ; Supplies, Public and Domestic Water ; Uses of Water. Arms, Karen. Environmental Science. Philadelphia, PA: Saunders College Publishing,1990. Cunningham, William P., and Barbara Woodworth Saigo. Environmental Science: A Global Concern, 5th ed. New York: WCB/McGraw-Hill, 1999. Gleick, Peter H. The World's Water 2002–2003. Washington, D.C.: Island Press, 2003. Solley, Wayne B., Robert R. Pierce, and Howard A. Perlman. "Estimated Use of Water in the United States in 1995." U.S. Geological Survey Circular 1200 (1998). Viessman Jr., Warren, and Mark J. Hammer. Water Supply and Pollution Control, 6th ed. Menlo Park, CA: Addison-Wesley, 1998. The U.S. Geological Survey (USGS) groups water-using sectors in the United States under two broad categories: offstream water use, and instream water use. Offstream uses are ones in which water is taken from a source and used elsewhere. Offstream water-use sectors include public supply, domestic, industry, irrigation, livestock, commercial, mining, and thermoelectric power. Instream uses are those in which water is used in place. Hydroelectric power generation is considered an instream use, as well as navigation, recreation, and fish and wildlife habitat. Selection of the optimum technology to support sustainable water use is the primary goal of water systems designers and managers. Two types of technology are important: those used in securing and managing new water supplies, and those that affect the need for new supplies. For new water-supply development, the technologies of concern are those associated with dams, pipelines, canals, pumping stations, wells, impoundments, and computer software for operating watersupply systems. Technologies that affect the need for new watersupply development are ones that reduce water-use requirements. Drip irrigation systems that greatly reduce water use in agriculture, and water-saving advances in household devices such as toilets, showerheads, and washing machines are examples.